Alaska’s Iditarod Trail Sled Dog Race is a grueling test of endurance for both humans and dogs, as competitors follow a trail more than 1,100 miles long through forests, over mountains and across frozen rivers. The sled drivers and dog teams are often caught in fierce blizzards that cause white-out conditions and can bring a wind-chill factor of 100 degrees below zero! Begun in 1973, the first 12 Iditarod races were won by men – but that all changed in the 13th race. 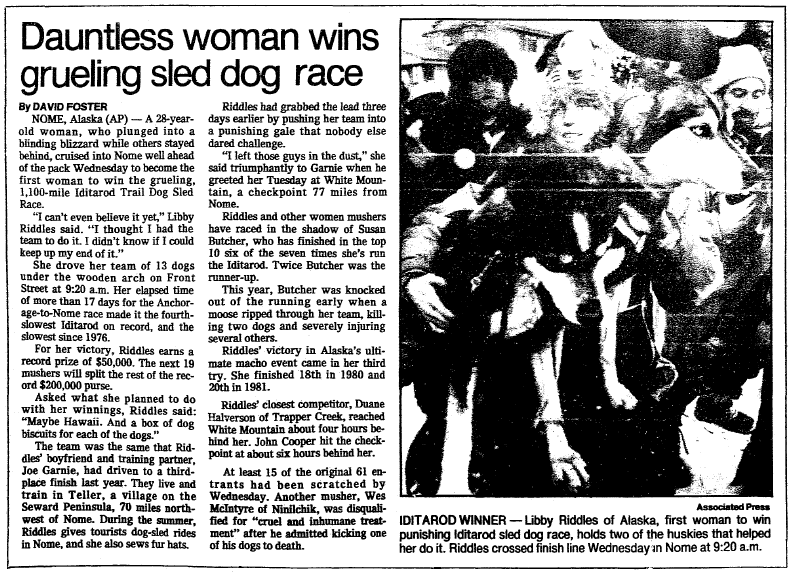 On 20 March 1985, Libby Riddles became the first woman to win the Iditarod. 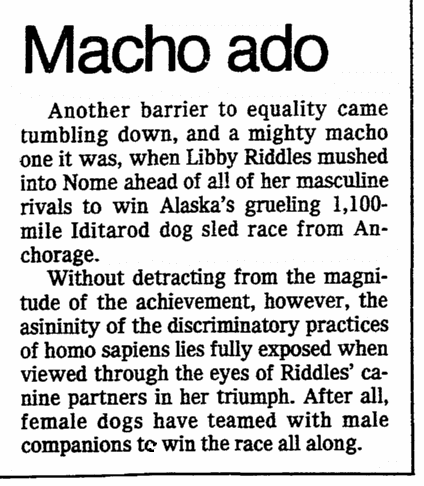 A 28-year-old musher and dog breeder, Riddles had run the Iditarod twice before, finishing 18th in 1980 and 20th in 1981. Her historic dog sledding victory in 1985 was the result of a daring and very dangerous gamble she took: when a tremendous blizzard struck the race, forcing the other drivers to hole up and wait for the storm’s passing, Riddles kept going. She and her dogs could have frozen to death, but they persevered—and the bold move gained her enough of a lead to assure her victory. For her victory, Riddles earns a record prize of $50,000. The next 19 mushers will split the rest of the record $200,000 purse. This editorial praises Riddles for being the first female to triumph over the males – but it makes a sly point. Newspapers are not only a great way to find your ancestors’ vital statistics – they are a tremendous resource for discovering the stories of their lives as well. Dig into GenealogyBank’s Historical Newspaper Archives and find your ancestors’ stories. Elizabeth Blackwell: First Woman Doctor in the U.S.